Facility Tours are open to any resident and student in Bartholomew County. Tours of the Columbus/Bartholomew Recycling Center, the Bartholomew County Landfill, and the Columbus/Bartholomew Yard Waste Site are both educational and entertaining! Please contact Kari Spurgeon, Education Coordinator by calling 812.376.2614 or email at kari.spurgeon@bartholomew.in.gov to schedule your tour today! HURRY spots fill up quickly! For more information download our New Education Resources Guide. Recycling Center tours are open to any age group and are offered year round. The maximum tour size is 50.During the recycling center tour; students will visit the Columbus/Bartholomew Recycling Center where they will see a variety of materials that are collected for recycling. They will also learn about what happens to these materials and how they are made into new products! In addition, students will learn how to recycle at home and school by sorting common households materials with kidscommons. They will also take a walk through our Bioswale (time and weather permitting), a natural storm water and run off filter. Check out the kidscommons educational brochure for complete listing of programs at the recycling center with kidscommons by age group by clicking here. Additional, tours at the Yard Waste Site are available upon request. 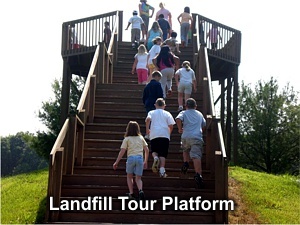 Landfill tours are available for 3rd grade and older and are scheduled seasonally due to the nature of the programs. Tours of the landfill and wetlands programming are available from school start through fall break and after spring break through the end of the school year. 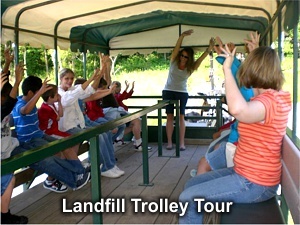 The landfill tour offers a unique experience like no other! During the students' visit to the landfill, they will experience the landfill trolley tour where they will learn about landfill construction, see an active landfill cell and learn how modern landfills are designed to protect the environment around them. In addition, students will also go through the Wetlands Educational program with kidscommons (which fulfills educational requirements for teachers!). In addition to learning about landfills, students will also learn about the 3 R's and what they can do at home and at school to preserve precious landfill space. Students will also have the opportunity to watch a video and complete various activities at the Education Center. For more information regarding specific kidscommons wetlands programming for each grade level visit the kidscommons website at www.kidscommons.org.